The ATPL250A-EK is a hardware platform for evaluating the ATPL250A modem for G3 power line communication. The kit provides easy access to the features of the ATPL250A and explains how to integrate the device in a custom design. 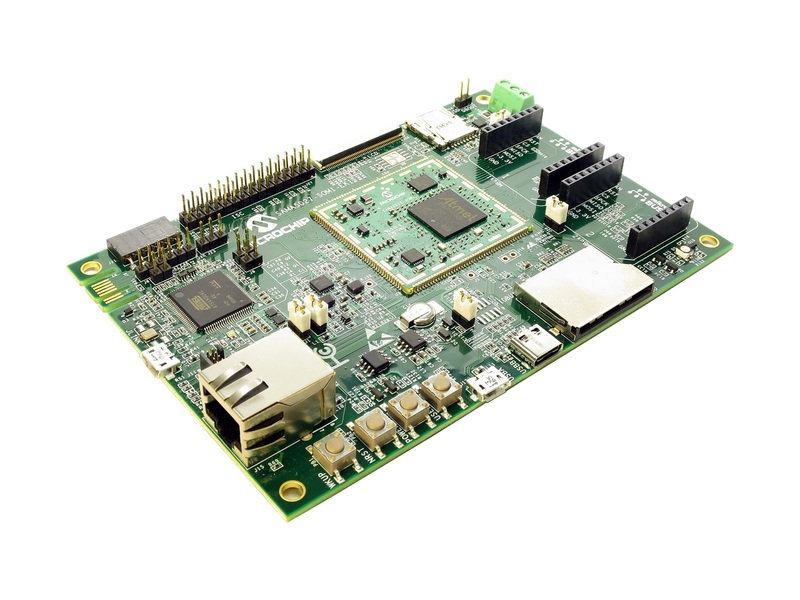 The SAMA5D2 Xplained Ultra is a fast prototyping and evaluation platform for the SAMA5D2 series of microprocessors (MPUs). 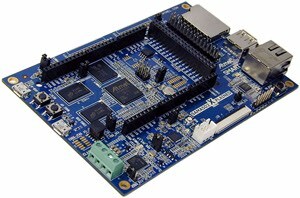 The board includes eMMC and DDR3 memories as well as a rich set of connectivity options. 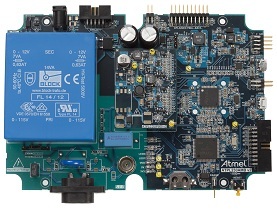 Connectors and expansion headers allows for easy customization and quick access to leading edge embedded features such as the Class D amplifier or the capacitive touch controller (PTC). A Linux distribution and software package allows you to easily get started with your development. The ATBASENODE-EK comprises one ATPL230ABN board and three couplings (for CEN-A, ARIB and FCC frequency bands), allowing evaluation of point to point Power Line Communications performance. 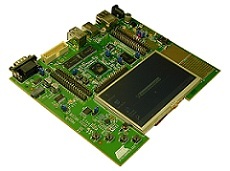 The PRIME Base Node reference design contained in this evaluation kit can be used to implement either complex, fully-featured Data Concentrators or simpler, less featured Gateway devices. Concentrators), Lighting, Industrial/Home Automation, Home and Building Energy Management Systems, Solar Energy and Plug-in Hybrid Electric Vehicle (PHEV) Charging Stations. ATPL230A is able to operate in independently selectable transmission bands up to 472 kHz, achieving baud rates ranging from 5.4 kbps up to 128.6 kbps. development board provides a full featured platform to develop a complete communications system based on Power Line Communication technology. 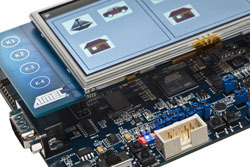 The SAMA5D2-PTC-EK is used to develop and evaluate capacitive touch controls using the Peripheral Touch Controller (PTC) module contained in the SAMA5D2 MPU family. The PTC provides built-in hardware for capacitive touch measurement on sensors that function as buttons, sliders, wheels or a touch pad. The PTC supports both self and mutual-capacitance measurements, up to an 8x8 button matrix, without the need for any external components. Features include adjustments for sensitivity and noise tolerance, as well as self-calibration, minimizing user tuning efforts. The PTC runs the QTouch Modular Library (QTML). A GUI-based PTC Toolbox software program is used to configure the touch features. QTouch extension boards QT1, QT2 and QT6 attach to the PTC-EK's XPRO wing connectors to demonstrate buttons, sliders, wheels and touch pad operation. The ATPANCOORDINATOR-EK comprises one ATPL250ABN board and three couplings (for CEN-A, ARIB and FCC frequency bands), allowing evaluation of point to point Power Line Communications performance. 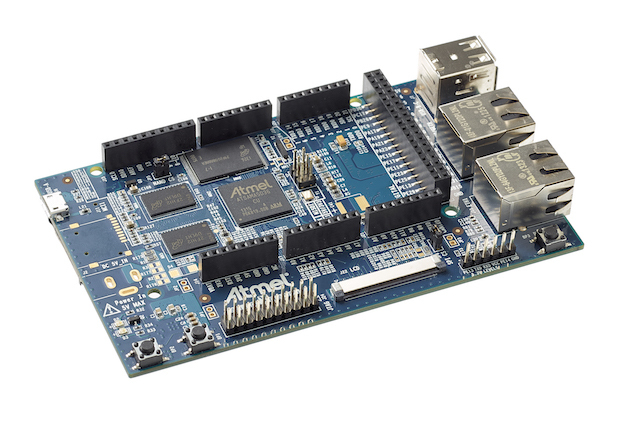 It implements an Atmel® Cortex™-M7 device acting as MCU host, combined with ATPL250A modem for PLC (Power Line Communication). ATPL250A is a power line communications base band transceiver, compliant with the PHY layer of G3-PLC specification. 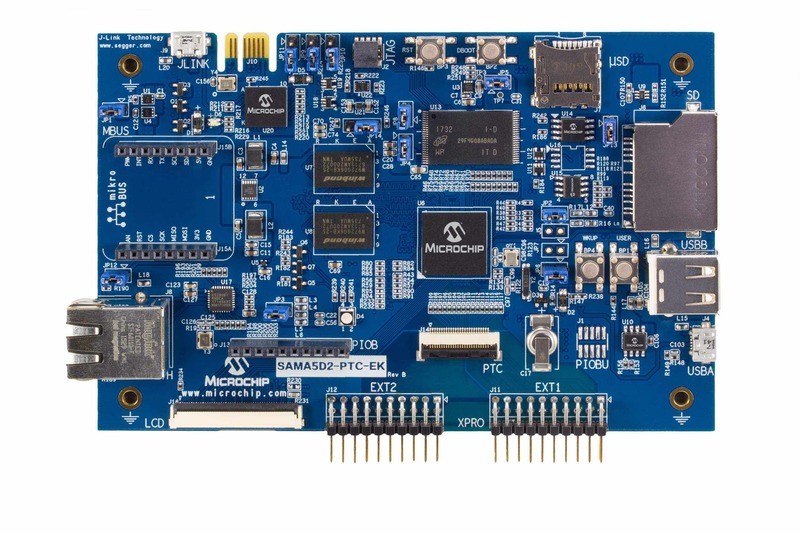 ATPL360-EK is an evaluation kit for the PL360B modem from Microchip. The evaluation kit includes two PL360MB smart metering boards, allowing to evaluate the performance of PL360B device in point to point links using Power Line Communication (PLC). 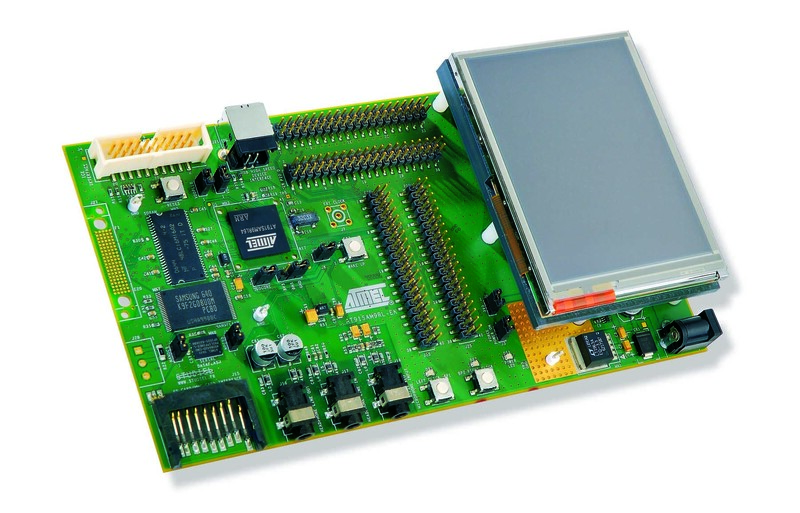 Each PL360MB board in this evaluation kit is a full-featured platform to develop a complete Smart Meter. 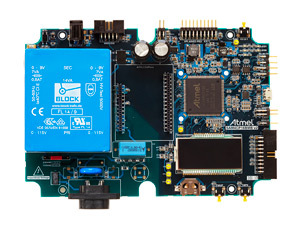 PL360MB boards include a PL360B modem for Power Line Communication (PLC), driven by a SAM4CMS16C ARM Cortex-M4 microcontroller with embedded metrology analog front end. 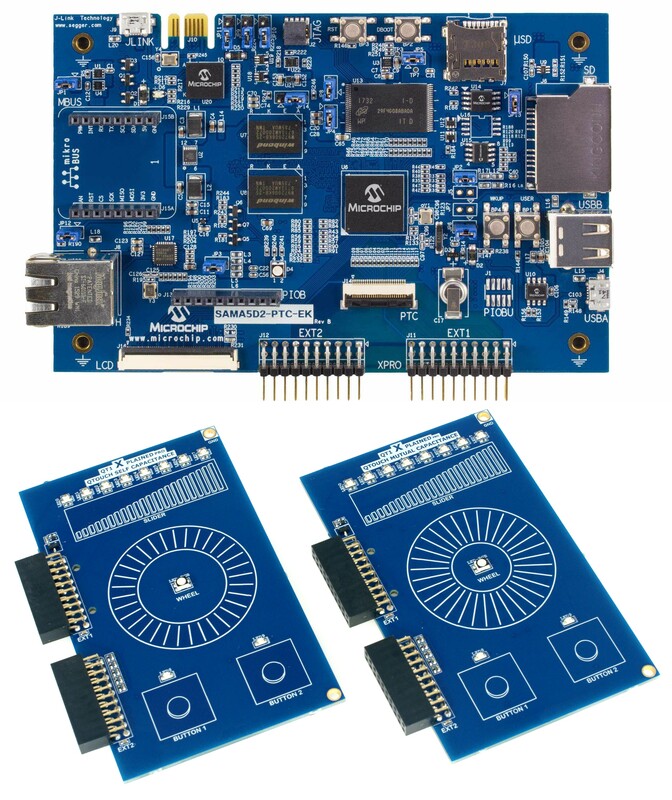 The SAM9CN11-EK evaluation kit enables rapid evaluation and code development of applications running ona SAM9CN11 or a SAM9CN12device. The SAM9G15 Software Package consists of SAM9G15 MPU peripheral drivers, software services and libraries. Each software module is provided with full source code, examples of usage, rich html documentation and ready-to-use projects for the GNU GCC, Keil and IAR EWARM compilers. 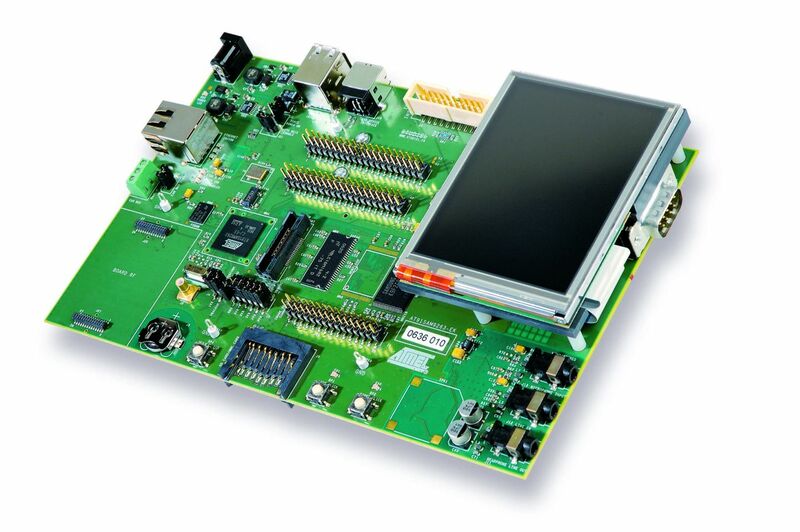 This kit lets designers quickly evaluate and develop code for applications running on the SAM9G20. The SAM9G25 Software Package consists of SAM9G25 MPU peripheral drivers, software services and libraries. Each software module is provided with full source code, examples of usage, rich html documentation and ready-to-use projects for the GNU GCC, Keil and IAR EWARM compilers. The SAM9G35 Software Package consists of SAM9G35 MPU peripheral drivers, software services and libraries. Each software module is provided with full source code, examples of usage, rich html documentation and ready-to-use projects for the GNU GCC, Keil and IAR EWARM compilers. The SAM9N/CN Software Package consists of MPU peripheral drivers, software services and libraries for SAM9N12, SAM9CN11 and SAM9CN12. Each software module is provided with full source code, examples of usage, rich html documentation and ready-to-use projects for the GNU GCC, Keil and IAR EWARM compilers. 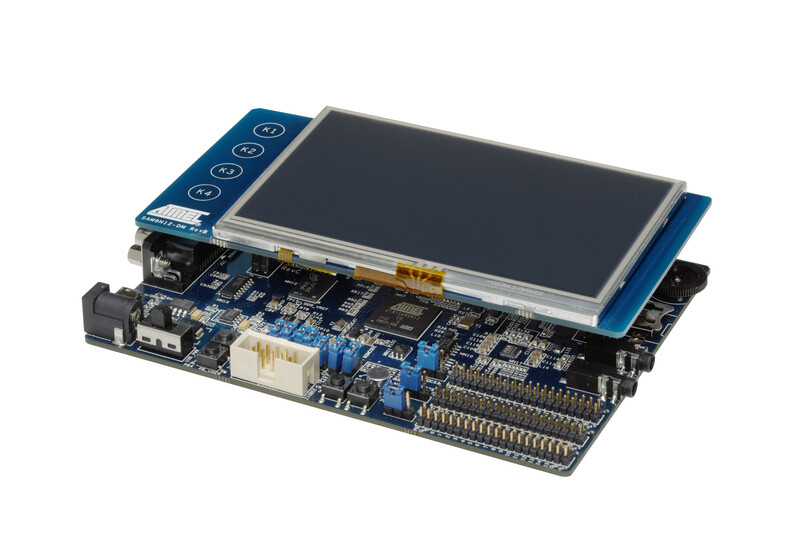 This kit lets designers quickly evaluate and develop code for applications running on the SAM9R64 and SAM9RL64 microcontrollers. 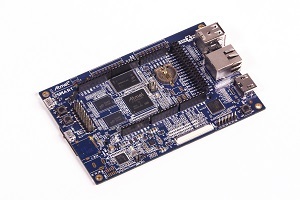 The SAM9X25-EK Evaluation Kit enables rapid evaluaton and code development of applications running on a SAM9X25 device. 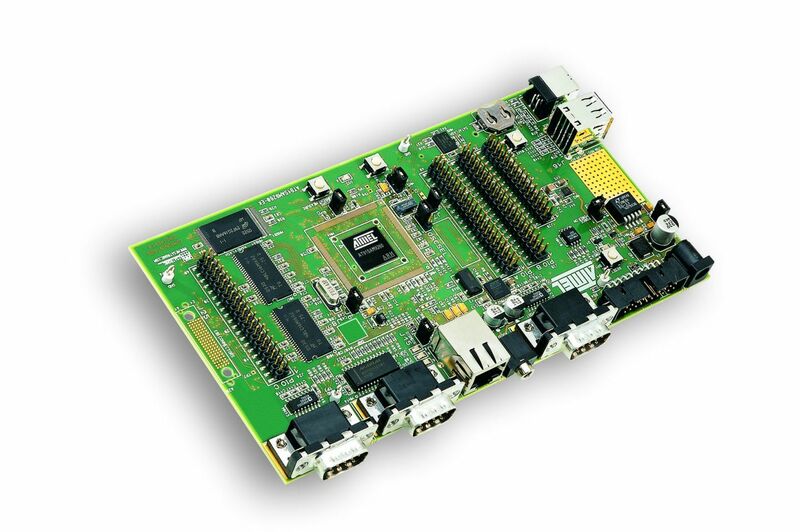 The SAM9X35 Software Package consists of SAM9X35 MPU peripheral drivers, software services and libraries. Each software module is provided with full source code, examples of usage, rich html documentation and ready-to-use projects for the GNU GCC, Keil and IAR EWARM compilers. The SAMA5D2 software package consists of MPU peripheral drivers, software services and libraries. Each software module is provided with full source code, examples of usage, rich html documentation and ready-to-use projects for the GNU GCC and IAR EWARM compilers. The SAMA5D4 software package consists of MPU peripheral drivers, software services and libraries. Each software module is provided with full source code, examples of usage, rich html documentation and ready-to-use projects for the GNU GCC and IAR EWARM compilers. 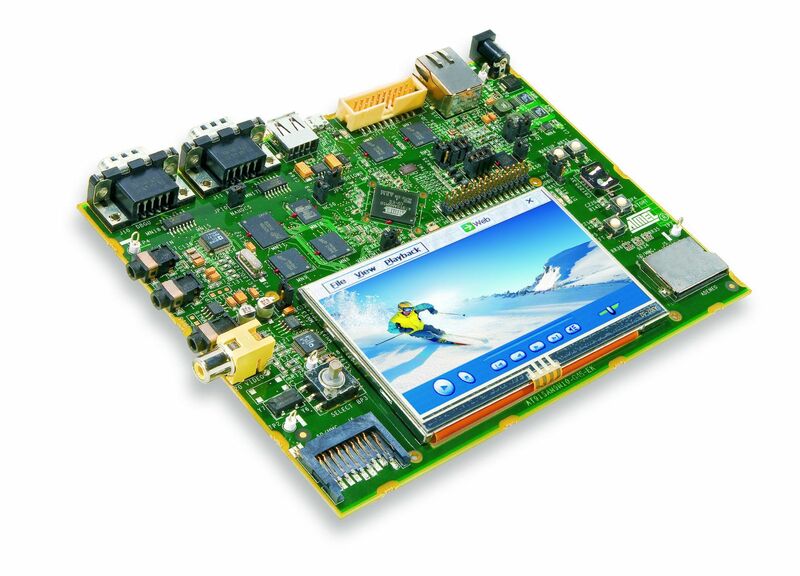 The SMART SAMA5D4 Xplained Ultra is a member of Xplained fast prototyping and evaluation platforms. 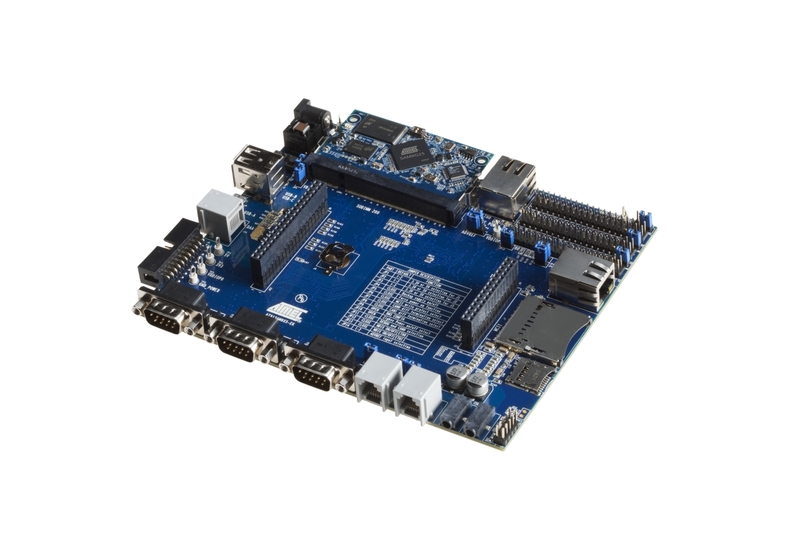 The board is based on the SAMA5D4 microprocessor and comes with a rich set of ready-to-use connectivity, an LCD and HDMI interface, an embedded debug interface unit, as well as storage peripherals and expansion headers for easy customization. A Linux distribution and software package gets you evaluating fast. A USB device connector can be used to power the board as well as to program and debug it.